Watch the Shore Conference Champs, Hart #2 All-Time! Watch both championship races below. There were three first time winners! Devin Hart ran 14:47 for second all-time at Ocean County Park, Amanda Stone was the first Shore Conference winner in Monmouth Regional school history, the Holmdel girls captured their first Conference XC title, and Christian Brothers Academy made it 12 straight! 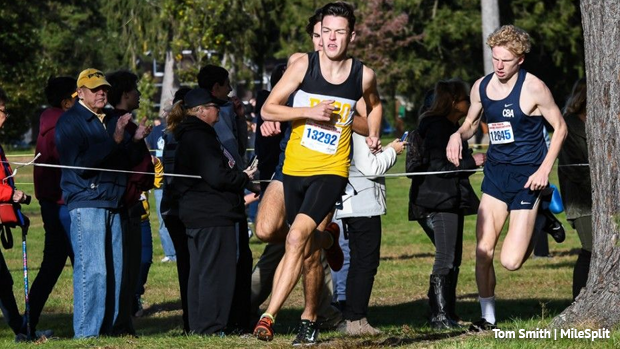 This was a very quick race up front, not only did Devin Hart run #2 all-time at Ocean County Park with his 14:47 but Tim McInerney moved up to #8 all-time as well under 15 minutes at 14:59! Hart, McInerney, and Shaw Powell were all battling up front early, with McInerney and Hart going through the mile around 4:29! Hart was just off the course record of 14:43 set by CBA's Mike McClemens in 2013. Remarkably for this multi-season Meet of Champions winner this was Hart's first Shore Conference title. The first for a Pt Pleasant Boro individual since 1991 when Terence Fagan won running 15:24. Team wise CBA earned it's 12th straight conference victory and 38th overall. As mentioned above Tim McInerney and Shaw Powell led the charge in second and third running 14:59 and 15:12. The rest of their scoring five saw Tristan Amell, seventh 15:43, Nolan Kus, 13th 15:58, and Tim Cahill, 16th 16:04. In the end a 1:05 split and 15:35 average! Monmouth Regional senior Amanda Stone became her school's first Shore Conference Champion. She battled back from a fourth place finish at Monmouth County to run 17:54 and win the Shore Conference title. Stone was a top returner from last season at Holmdel Park and hopes to have a big state meet season in November. Also having a great fall is Delia Russo of Colts Neck who finished second at 18:04, she won Monmouth County Championships last week and has really taken to the #1 role on the NJ#9 ranked Colts Neck squad who placed second at this meet. Colts Neck wasn't the only state ranked girls team in this race, the winning score pointed right to NJ#5 ranked Holmdel HS. The Holmdel girls have really taken this season by storm, winning their first Monmouth County Championship title in school history last week and following that up with their first Shore Conference title. They've really proven their stock and moved up the state ranking through performance. The Holmdel Hornets were led by junior Emily Levonas in fifth running 18:14, Claudia Zhang in 14th 18:41, and Caitlyn Joyce 16th 18:46 all under 19 minutes. The top five was finished up by Alexa Blasiak in 28th at 19:17 and Nicole Sportelli in 32nd 19:21. There are no seniors on this squad, so keep an eye out for Holmdel Park moving forward! You can watch their team interview here.